The Immortal Greek: An Epic Free Run! Hi, everyone! In case you don’t receive my newsletter, I would like to personally thank you for making my last free run the most successful ever. 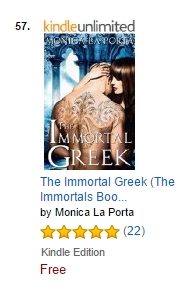 Shy of 10.000 copies, The Immortal Greek has been downloaded all over the world and it’s now at #57 on Amazon Free Best Sellers list. Thank you!!! Please, keep sharing my promo to help me finish the last day of this already epic free run with a bang! The Immortal Greek is alive! The Immortal Greek is the second title in The Immortals series, and takes place one year after The Lost Centurion’s events. Alexander Drako, Marcus’s longtime friend and immortal himself, has lived a long and full life. Rich and famous, he is a carefree character until Ravenna, the Enforcer who brings the bad guys of the paranormal world to justice, enters his life. For Alexander, one day is parties and easy conquests, the next is death, deception, and unexpected love. As for the previous title in the series, The Immortal Greek too is set in modern-day Rome, which makes it one of the few urban fantasy and paranormal novels that has The Eternal City as one of the characters. Alexander, Ravenna, and the rest of the immortals, vampires, and fallen angels populating the story have to deal with a crowded, loud, but ever so charming Rome as they try to find the truth about a series of suicides among the paranormal community. I have left people vote on my Facebook author page for a few days, and the majority seems to like the cover with the couple. Having taken in consideration several suggestions, here is another trio to vote for. The Immortal Greek will be out for the grabs on August the fifth, and I am looking for Facebook pages and blogs to advertise it. I will gift ecopies for your giveaways and any material you might need to run the event. Just fill the form. Thanks in advance! I am almost ready to release The Immortal Greek, second title in The Immortals series, and I am testing two covers. So far, the consensus on my Facebook author page is almost unanimous. I am curious to see if the blogverse thinks differently. I threw a third cover in the midst just to gauge reactions about two similar concepts.